One of the common issues we see with the Duramax engines is head gasket failures. The gaskets in all years of 6.6 Duramax pickups are a multi-layer steel style gasket. Over time as the head/block surfaces warp and the strength of the head bolts weaken, the head can lift causing combustion pressure to go directly into the coolant system. This can also occur under high horsepower/boost situations. As you can see from this picture of a multi-layer gasket, if the gasket is allowed to expand anywhere between the head and the block, you have the potential for leakage. This is a common failure on higher horsepower engines that create cylinder pressure that overcomes the clamping load of the stock head bolts allowing the head to lift. Almost anytime you have a head lift even just once, you have compromised the integrity of the gasket and you will need to replace it. Many people will not think they have a head gasket problem because they are not seeing any smoke out the exhaust or smell coolant burning. This is because when the truck is running combustion pressure is pushing its way into the coolant system through the bad spot in the gasket. Once the truck is shut off, the gasket is still able to seal the low pressure coolant system from entering the cylinder. There has to be a fairly extreme failure to let coolant into the cylinders through the head gasket. So how do you tell if you have a blown head gasket? The first thing you will probably notice is that you are losing coolant but do not see any leaks. Most of the time the coolant will slowly get pushed out the overflow hose in the passenger fender area which makes it hard to see. This usually also happens under throttle so the movement of the vehicle disperses the leaked coolant quickly. Also, combustion gas in the coolant system will usually make the temperature run really cool then really hot when working the truck. If your temperature gauge suddenly starts running colder than it always has, you may have a head gasket problem. The quickest and easiest way to check for combustion pressure in the coolant system is to squeeze the upper radiator hose while the truck is running. (Please be careful and use common sense because the hose is hot) You should be able to nearly flatten the hose. If it is rock hard, like an inflated tire, your head gaskets are leaking. Some shops will do an actual pressure test to see what the coolant system is running at along with a testing of the coolant system to see if combustion gases are present. 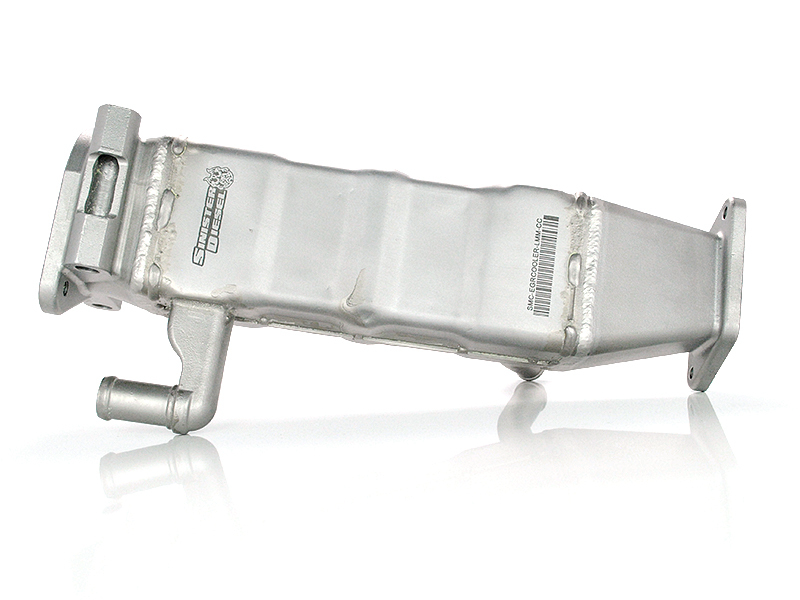 Something to also be aware of it that the egr cooler can also put exhaust gasses into the coolant system if they have a leak. One of the first things we suggest when starting to tear down a Duramax pickup for a head gasket job is to remove and test the egr cooler. Pressure up the coolant passages and see if it leaks. Occasionally we will find one of these ruptured and save our customer the expense of a head gasket job. Usually though if a cooler is leaking you will see some smoke from the exhaust as the engine will actually be burning the coolant as it leaks. So what is the best way to fix a head gasket problem? First thing that is absolutely necessary is having the heads sent to a machine shop and having them pressure tested and then surfaced. You don’t want to reinstall the heads to find the problem persists because of a crack into the coolant passage. Secondly, these heads are almost always warped. If you install a new head gasket on a warped head there is a very good chance it will leak immediately. There is often a common concern that the compression ratio will change. It will not. The bottom of the head is flat with no combustion chamber. Surfacing the head area does not change the cylinder head to piston volume at all. The only thing that must be carefully checked is the piston to valve clearance. Most good machine shops will automatically check this when performing the work and make the necessary adjustments to the valves if needed. We also get asked all the time about the head gasket thickness and different Duramax head gasket grades. This is a source of much confusion. The Duramax diesel engines came with three different grade thickness head gaskets. They are labeled A, B, or C. It is tough for most people to tell what gaskets they have before tearing the engine down. Some engines have a B on one side and an A on the other. In all of head gasket and engine kits, we always send two C gaskets. This eliminates all confusion and worry of piston to valve interference. This is also a little bit of extra protection if you had the heads surfaced. There will be no effect on compression ratio or engine performance that you will be able to notice. 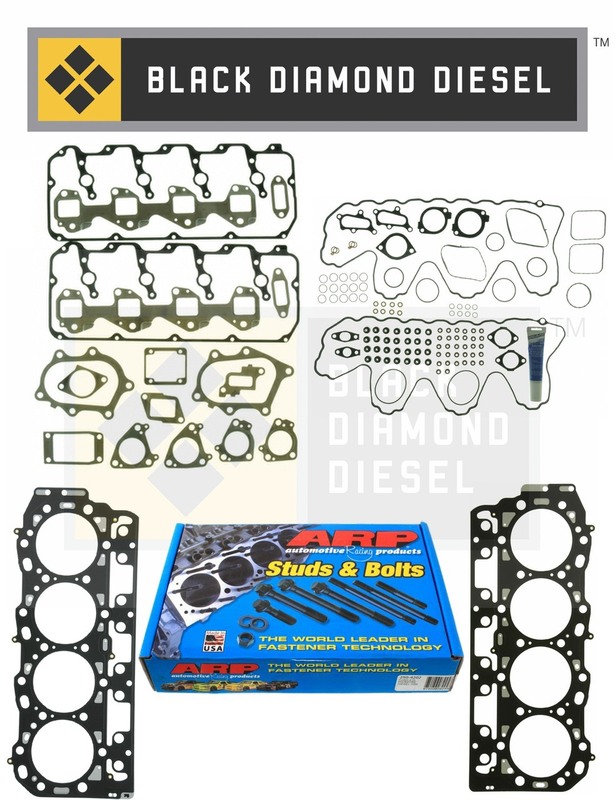 The last question we get a lot about Duramax Diesel head gasket replacement is whether to use stock head bolts or ARP head studs. It really depends on what you are doing with the truck. If your truck is bone stock and you just use it for daily commuting and occasionally tow a small trailer, you will probably be safe with stock head bolts. For any other power level or usage, I would highly recommend upgrading to ARP head studs. The higher quality head studs will provide not only a stronger clamp load, but also a more evenly distributed one. 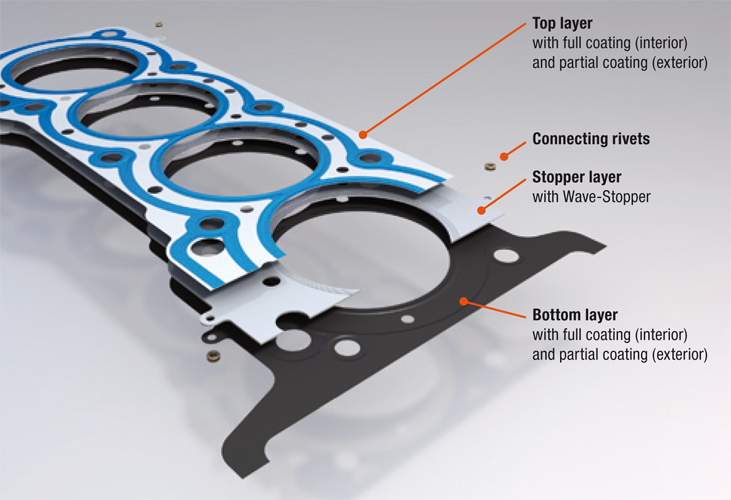 Since we know that keeping the head gasket sandwiched between the block and head is extremely crucial with multilayer steel gaskets, the better the clamp load we can provide the better. If you have any questions on your Duramax diesel head gasket replacement job or even just troubleshooting, please give us a call. We are glad to help.